It came just a week after I posted my parenting and ministry battle cry…a self-reminder to stay faithful in planting the seeds. fruitfulness in praying for neighbors. fruitfulness of continuing to host Shalom Nights each week to have a meal, worship and study Scripture together. fruitfulness in the simple act of showing up, even if only a handful of others show up with you. The news came from a guy on our team. 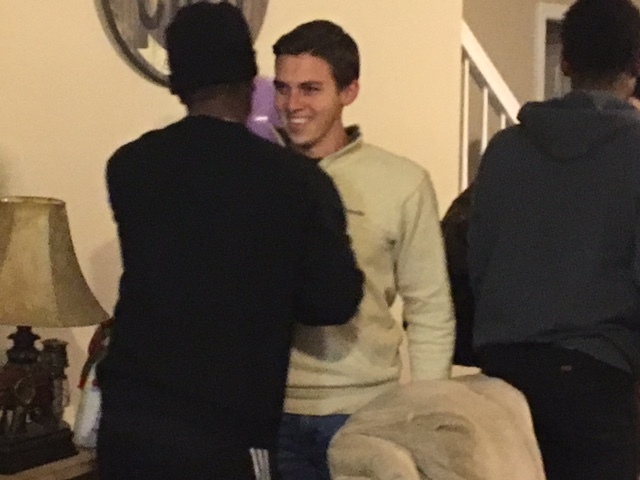 A guy who saw the vision, bought a house with a friend in our community, and started a Shalom house of their own….all within a year of graduating college. A guy who has seen many set-backs and heartbreaks and seemingly little fruitfulness from those he has poured into. But then. Then this happens…. What if prayer works? What if God really does hear us? What if He actually does follow through on His dozens of promises when it comes to answering our prayers? I love John 15:7. Jesus says, “If you abide in me, and my words abide in you, ask whatever you wish, and it will be done for you.” That’s a pretty good combo. When we’re really living in sync with Jesus, then our hearts will long for the same things as Him, and we’ll pray for the things He wants too! It’s easy for God to answer prayers for things He already wants. Somebody once told me: “I don’t try to change a man’s heart. I pray to the God who changes men’s hearts.” So that’s what we did! We started asking God to move in our neighbor’s heart. This past Sunday at house church, prayers were answered. Jonathan and I had been pretty busy all weekend, with both of us being out of town until the afternoon of house church. We usually have something prepared to teach on, but this time, not so much. As we talked on the phone Sunday afternoon, we agreed that maybe God just wanted us to do a classic sharing of the gospel using Ephesians 2. And holy cow, God moved. We had a pretty big crowd (which we sometimes consider a big movement of God in itself), and had some new friends hang out with us. As we finished our teaching about completely surrendering to Jesus, the question was asked if anyone wanted to give their life to Jesus today. Without a second of silence, Hakeem quickly said, “I want to do that.” And he sounded like he was in a hurry to do it! We were a little surprised! But we immediately started praying as a group, and then Hakeem started praying. And when I say he was praying, I mean laying it all out there. He later told me that as he was praying, he heard God say, “Let me talk.” So he opened his mouth, and just let God talk. As a result, this fifteen-year-old kid began spouting off scriptures he’d never heard before and apparently was seeing some things too. Hakeem literally said, “God I see your hands coming from the sky. You want me. And I want you too.” Amazing right? It gets better. I asked him if he wanted to ride with me as I drove other neighbors home. Let’s keep this in mind, Hakeem isn’t exactly a theologian, so the quotes you’re about to hear made my heart almost beat out of my chest. As we’re walking out to my car, he looks at me with tears in his eyes and says, “I can’t explain it. I have so much joy. And it feels like I’ve been born all over again. I feel new. (John 3:3)” He keeps on talking as we’re riding. “Taylor, I felt so dirty coming to your house tonight. But it feels like Jesus came and made me completely clean. I feel clean! (2 Cor. 5:21)” After we drop off our friend, he says, “You know, when I was younger, I was baptized with water. But this time feels different. It feels like I’ve been baptized in my spirit! (Mat. 3:11)” I just started laughing when he said that. That’s exactly what happened! He said, “It feels like Jesus came and just took over my heart. It feels like He’s inside of me. (Eph. 3:17)” YES! HE IS INSIDE OF HIM! I could go on and on, but God performed a miracle this past Sunday night. Thank you for praying for our new brother, Hakeem. So, my friends, and those weary of heart, may we not neglect that secret place of prayer. For under the earth, God is sprouting and growing and putting things into motion for fruit to come from our labors and intercessions.